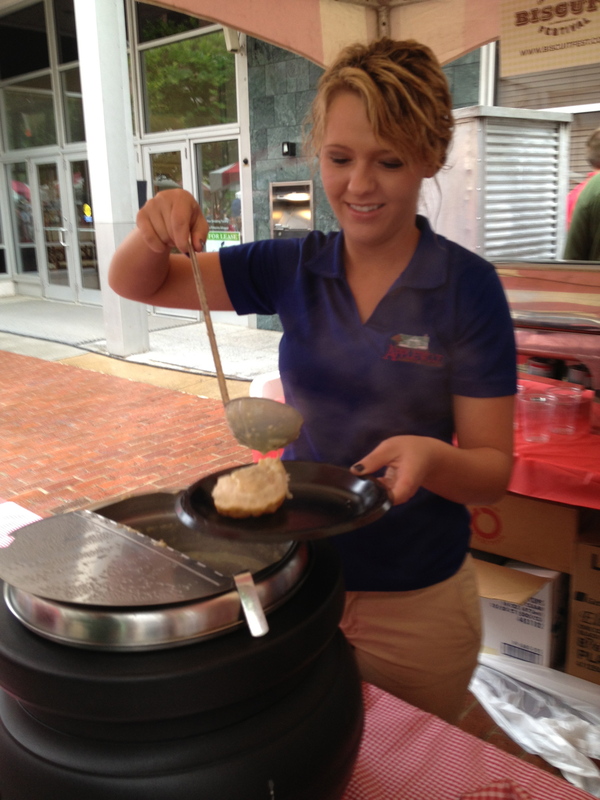 “Puhleeze” butter my biscuits in Knoxville at the International Biscuit Festival! | Oh, the Places We See . 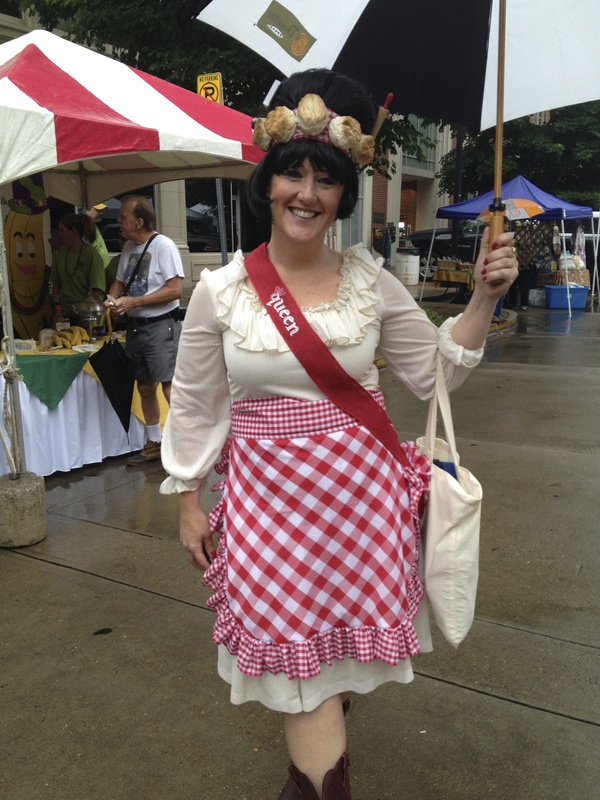 . .
“Puhleeze” butter my biscuits in Knoxville at the International Biscuit Festival! This post was published on June 1, 2013, but we’re sharing it with you again just to whet your appetite! 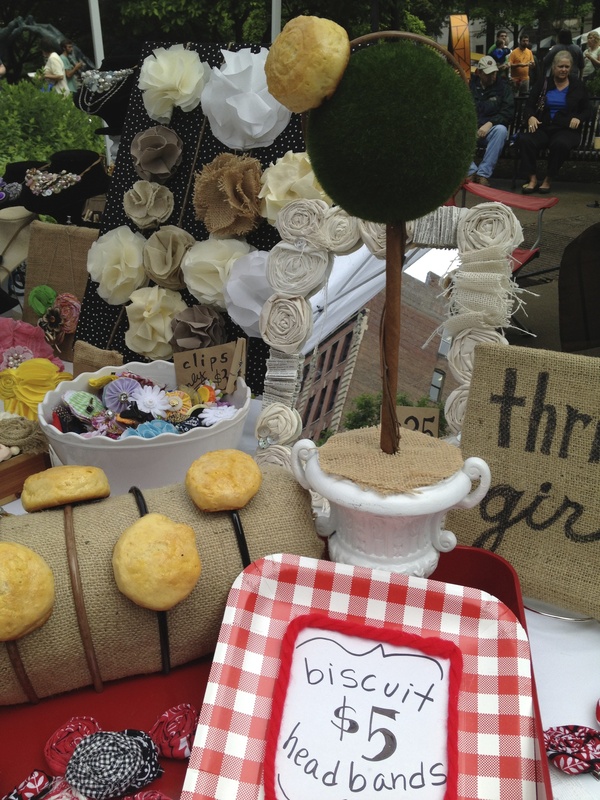 The International Biscuit Festival returns to Knoxville, TN this weekend with big events — booths, vendors, music, and, of course, tasty biscuits — on Saturday, May 17, 2014. Join us! Click here for more information. 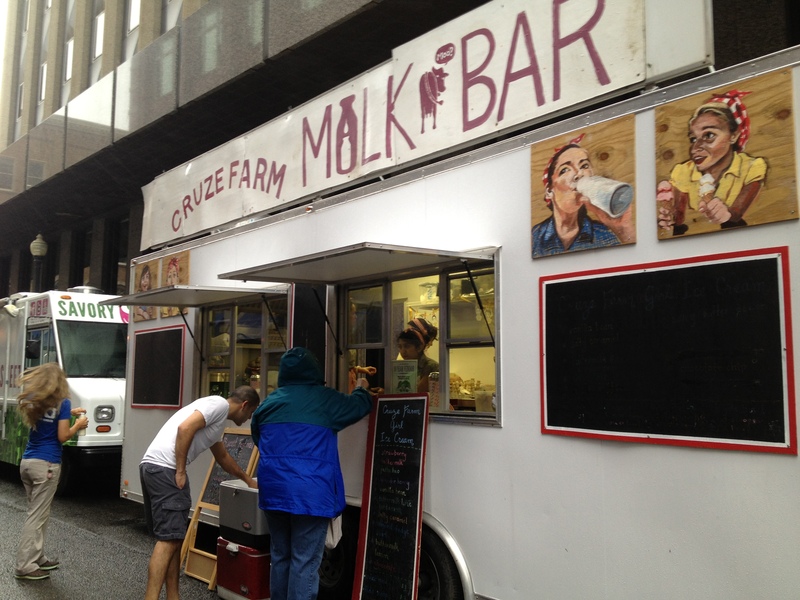 We passed the Cruze Farm Milk Truck on our way to get coffee and then checked out the booths as they prepared for the onslaught of 20,000 festival goers — ready to dig in to the doughy delights. The crew from Plaid Apron stopped a minute for a picture but quickly got to work setting up their chalkboard with what had to be the longest name in the best biscuit competition: Candied Benton’s Bacon, Clabbered Cream, Honey & Balsamic Reduction Buttermilk Biscuit! Sapphire‘s was ready early on, so this blueberry specialty was one of my first of five samples I could get with a $10.00 ticket. Delicious! By this time, the crowd packed the boulevard and long lines were ahead of us. 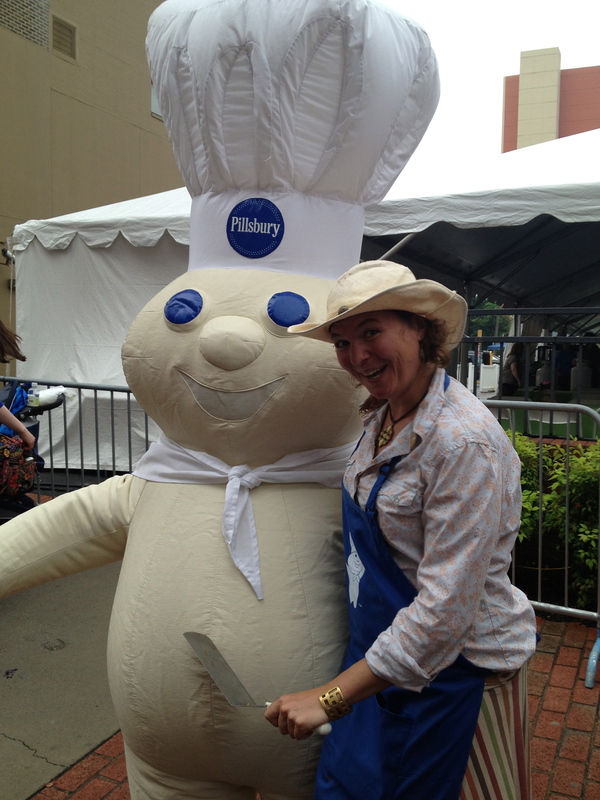 The Pillsbury Dough-Boy stood ready with his newly acquired friend Rather from Crested Butte, Colorado. Husband Bert grabbed a Grilled Biscuit Sloppy Joe from their tent! After spying another long line, we knew something good was waiting where the man in a red shirt from Applewood Farmhouse greeted everyone with a smile. Sure ‘nough. Winning the People’s Choice Award with the most guest votes was their Andouille Shrimp and Grits Biscuit — hot, spicy, and not on anyone’s diet, for sure. No wonder they took home the Biscuit Sunsphere Trophy! But not to be outdone, RT Lodge now has bragging rights from the critics with their Deep Fried Biscuit with Braised Short Rib and Pickled Onion. Mmmm. A mixture of savory, spicy, and vinegary all in one. Deserved that Critic’s Choice Award! 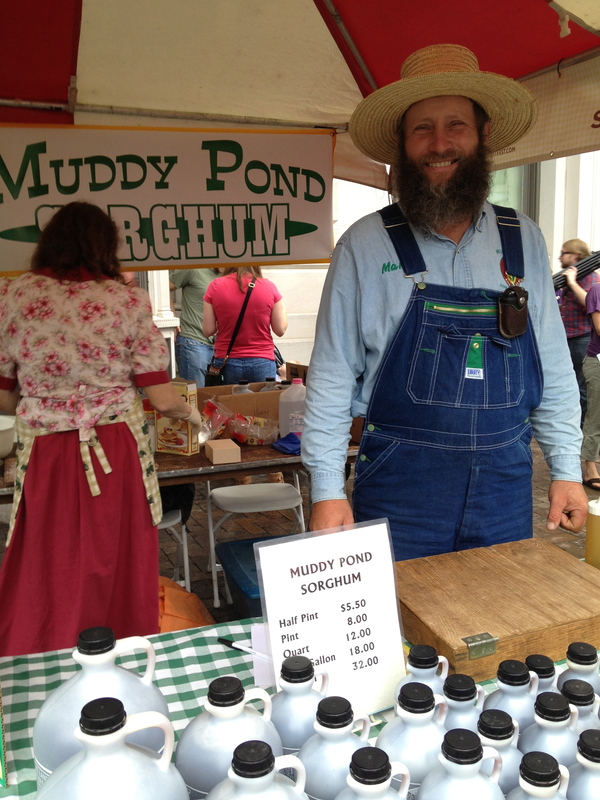 If biscuits alone weren’t enough, there was even our favorite East Tennessee syrupy goodness from the Guenther family in a booth down the street: Muddy Pond Sorghum! 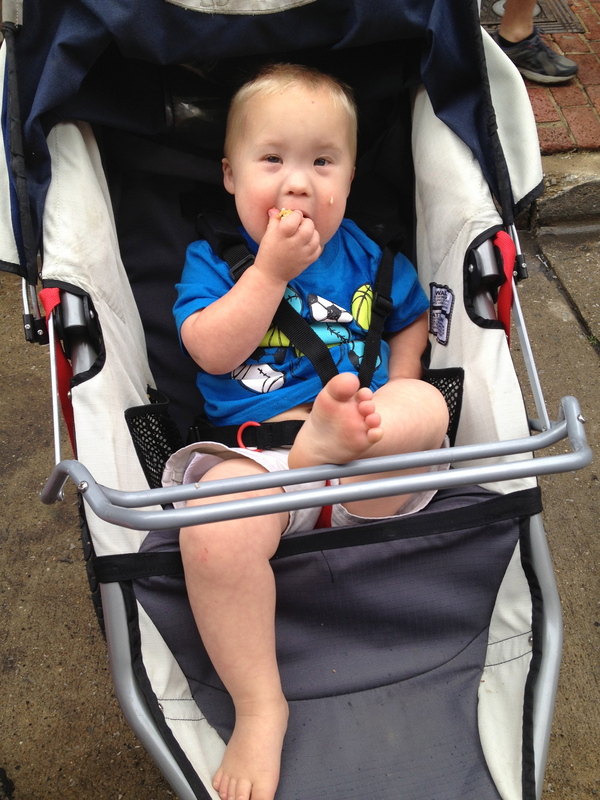 At the Biscuit Festival, even little kids get into biscuit eatin’ — like this happy fella who likes packin’ it in while strolling . 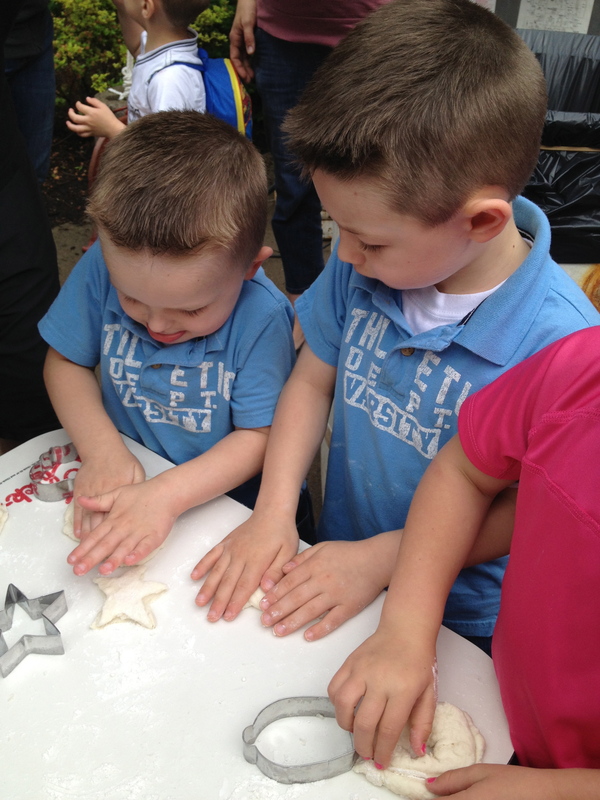 . .
and these rather cooperative brothers in the children’s tent patting and rolling and cutting biscuits just like the chefs do! 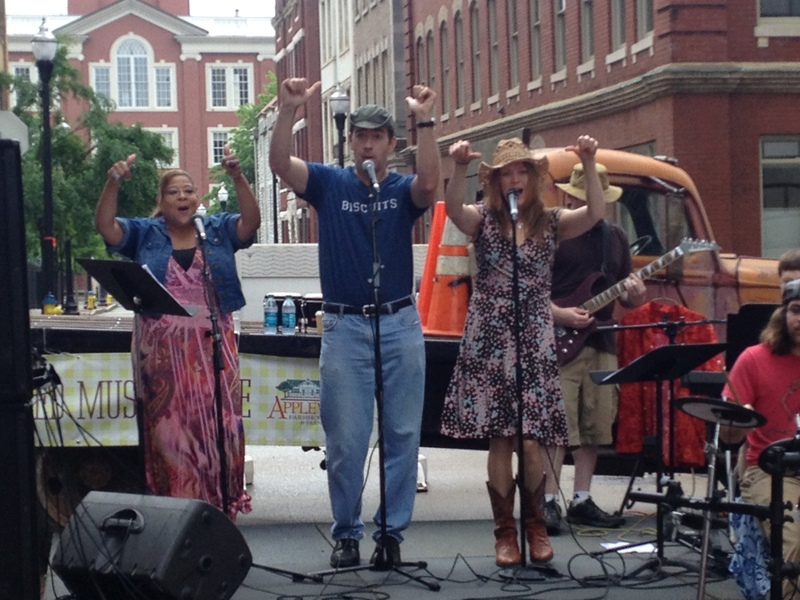 Since we were stuffed from more carbs than we usually eat in a month, we were glad to take a break and enjoy the lively lyrics and thumping, hand-raising sounds of Jimmy Brown Johnson and the Band of Awesome on the Flatbed Music Stage. No one stood still — or even wanted to! 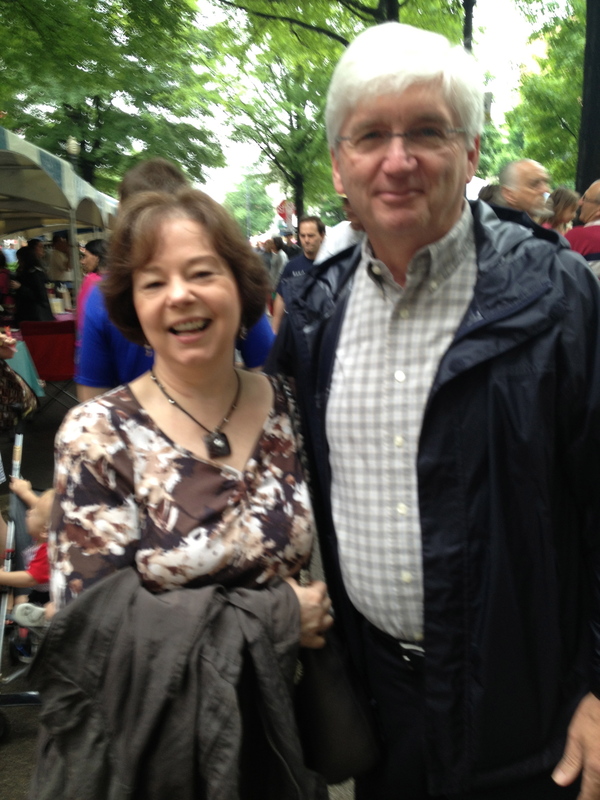 We stopped to talk to our friends Kathy and Dan Hamilton who were on their way to the Blackberry Farm Biscuit Brunch in Krutch Park Tent. From all accounts, this is the culinary route to a great Saturday, so we may have to try it next year. 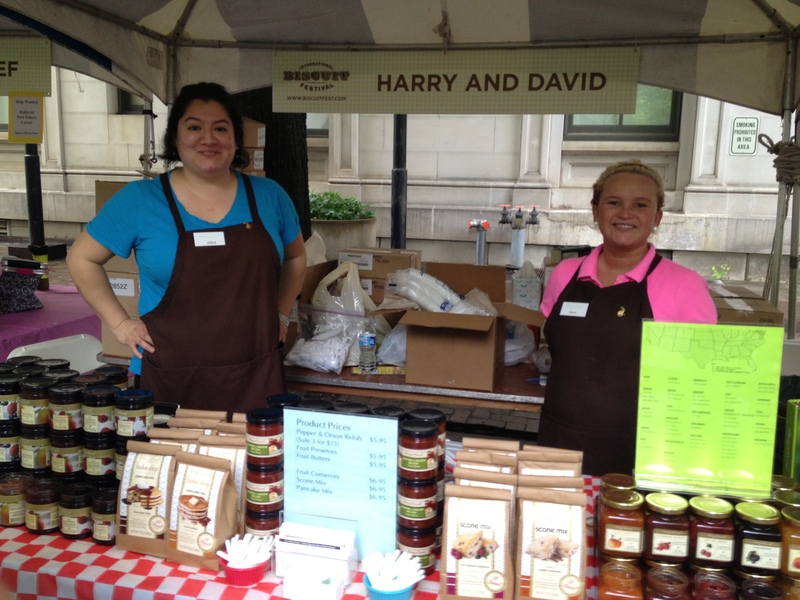 Harry and David set up a booth for the first time this year . . .
and B97.5 motioned us over for more freebies on a plate. 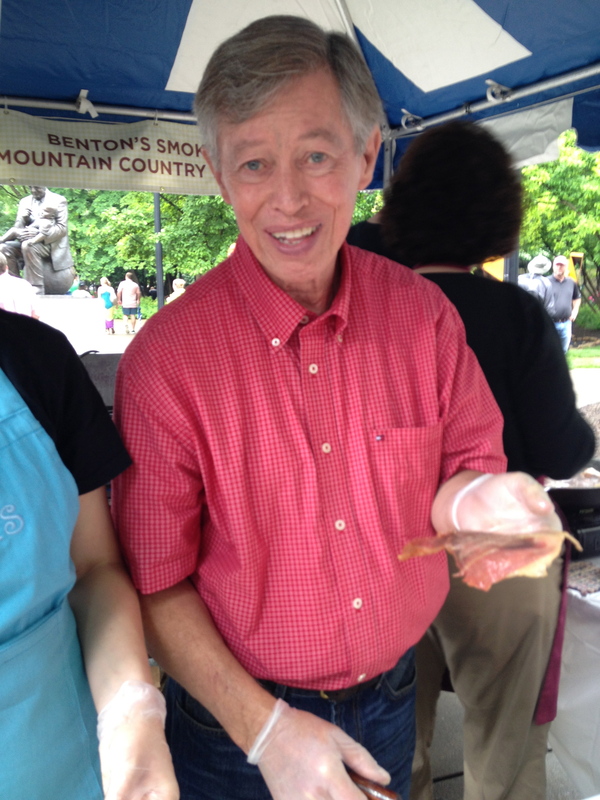 We almost did a double-take when we saw the Benton’s Smoky Mountain Country Hams booth with the owner himself, Allan Benton, serving his nationally-famous smoked country ham and bacon. I said to him, It’s a pleasure to meet you, Mr. Benton. And you’re still smiling after being on your feet all morning? 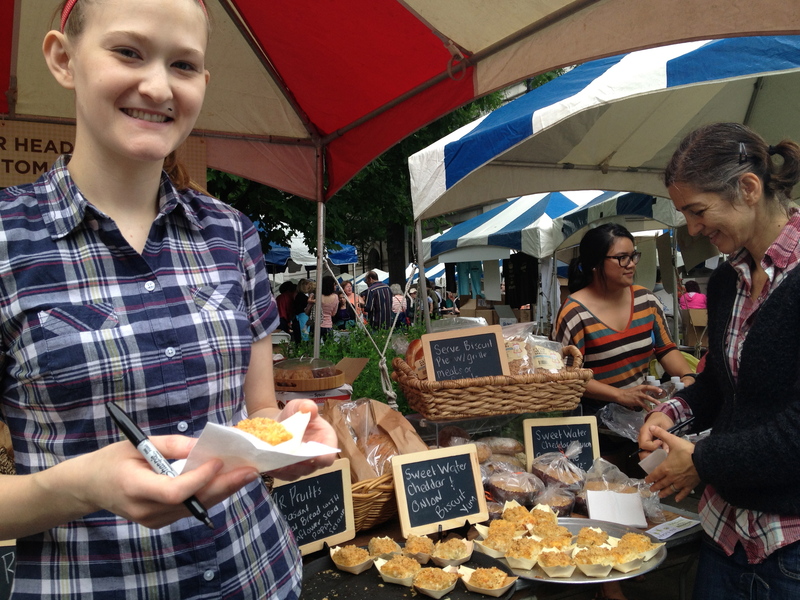 We mozied back around to Market Square to take in some of the crafts and farm-fresh foods brought in for the day. 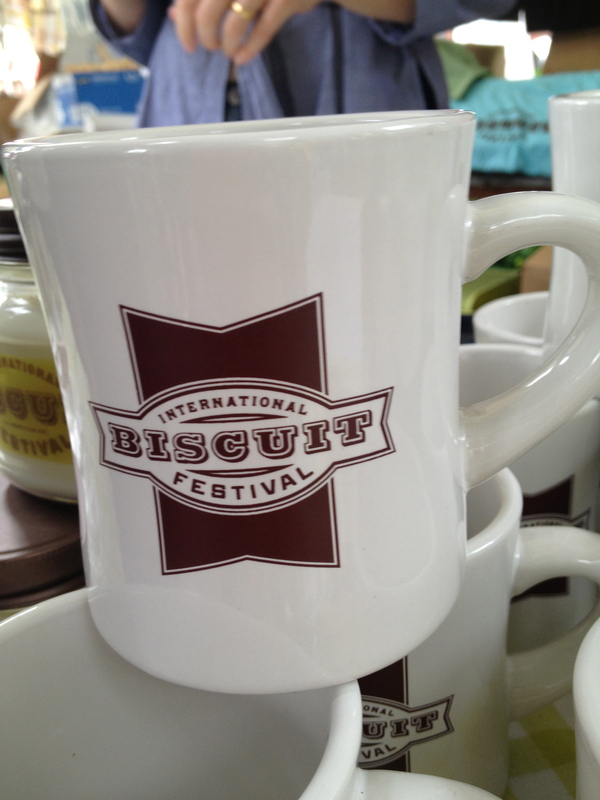 We found Biscuit Festival mugs . 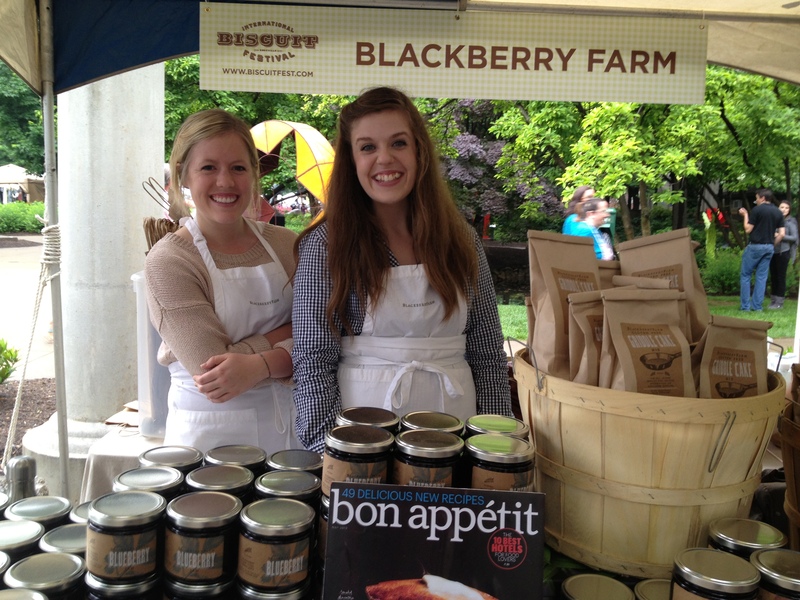 . .
and Blackberry Farm products you can purchase online or from their catalog. (No surprise: They have blackberry jam!) Click here for more information. And wouldn’t you know, we’d find something never seen by us before. 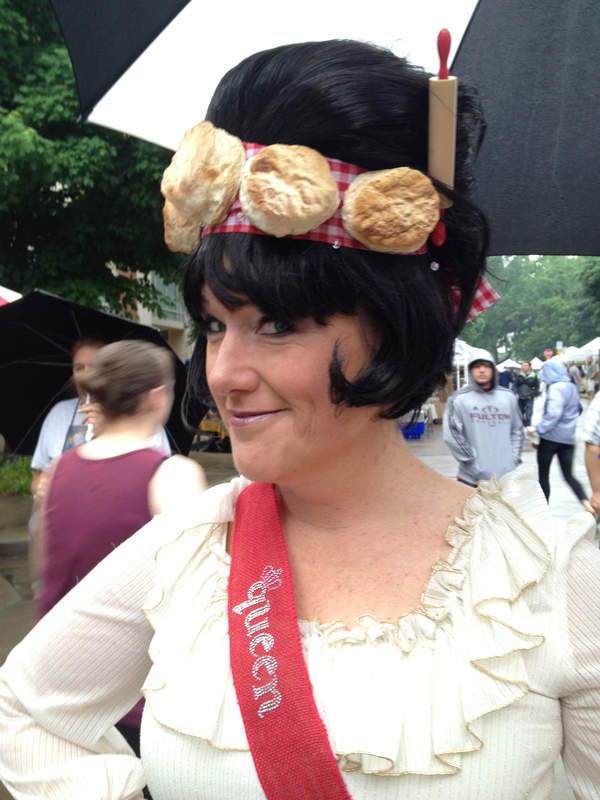 Thrifty Girl brought something every biscuit lover needs to wear: biscuit head bands — I kid you not! One of kind, wouldn’t you say? In fact, it’s just the sort of thing Erin Donovan, broadcaster for WBIR, might like to add to her growing wardrobe of must-have wearables with a biscuit theme! She’s the Biscuit Queen for a reason! 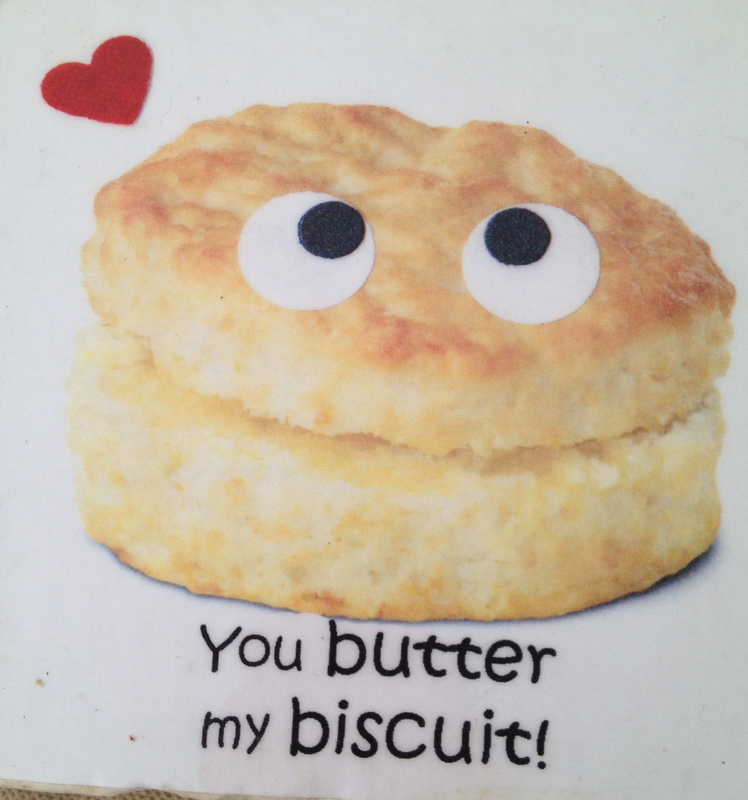 If you haven’t been to the International Biscuit Festival, make plans for next year: May 14-16, 2014. It’s a feast. It’s a fun day. 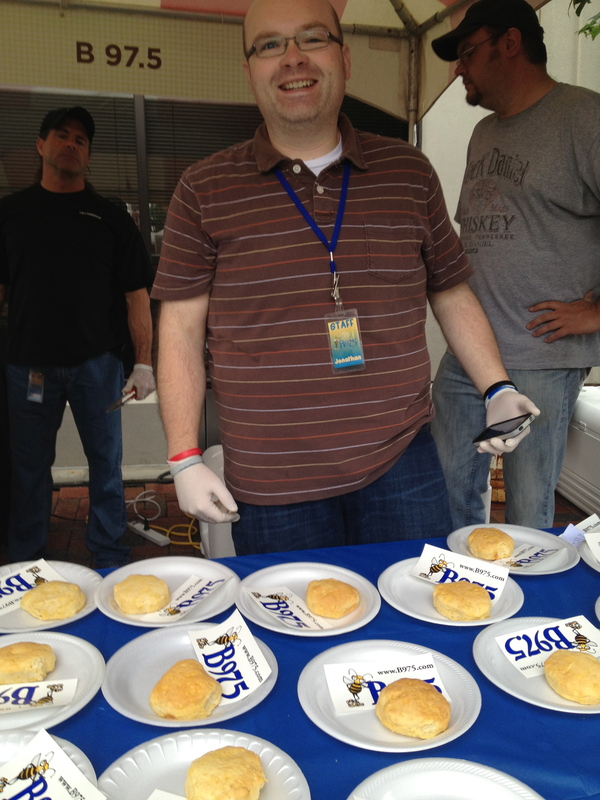 And as organizer John Craig says, Who doesn’t love a biscuit? 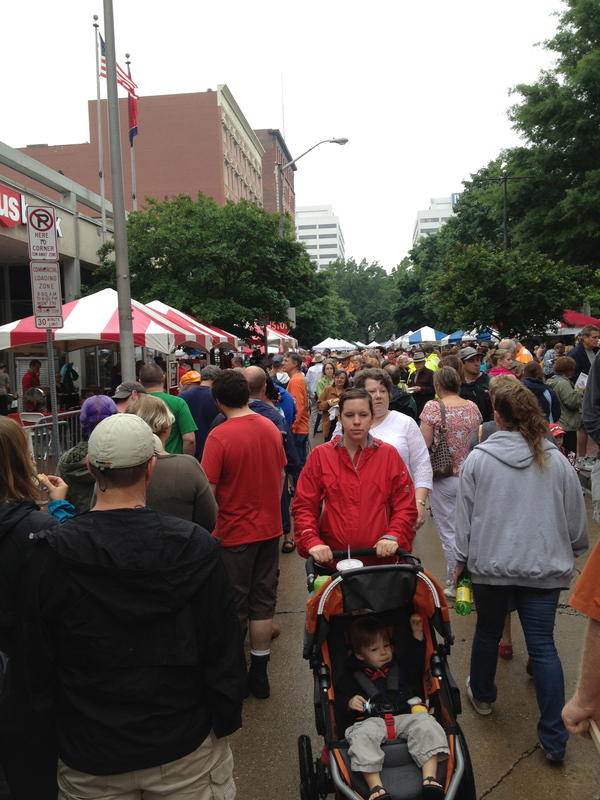 Click here for another blog on the International Biscuit Festival from Stuck Inside of Knoxville with that Urban Blues Again. This entry was posted in Destination, Festivals, Restaurant, Tennessee, Travel and tagged Applewood Farmhouse, B97.5, Benton's Country Hams, Blackberry Farm, Cruze Farm, Erin Donovan, Jimmy Brown Johnson, Muddy Pond Sorghum, Plaid Apron, RT Lodge, Sapphire, Southern Living, Tomato Head, Tupelo Honey Cafe. Bookmark the permalink. 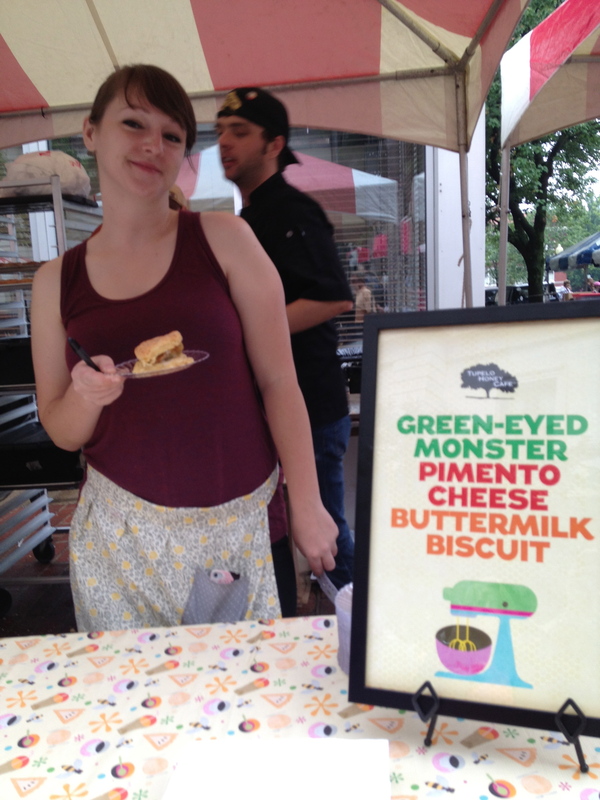 15 Responses to “Puhleeze” butter my biscuits in Knoxville at the International Biscuit Festival! Come on down! We’d love to have you! So fun Rusha – but the first and last are just wonderful!! 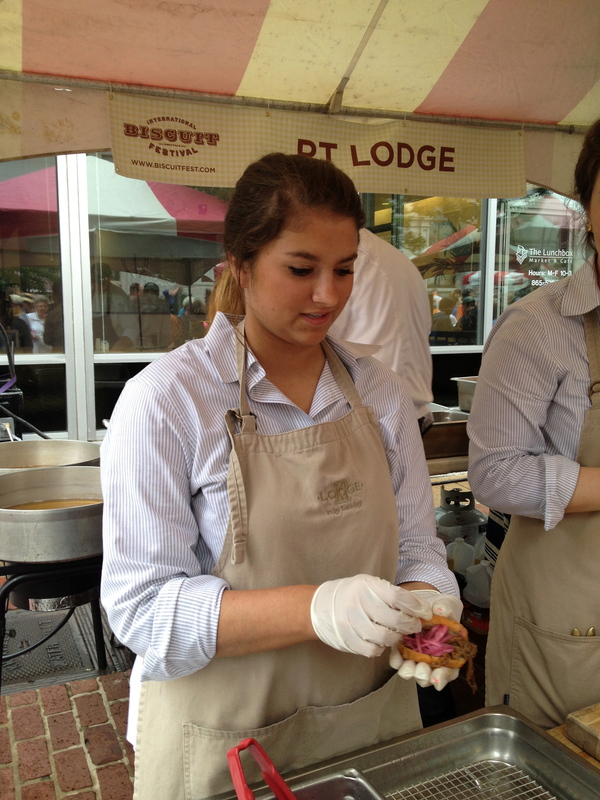 Makes me want to start our own biscuit festival here in the south!! LOL. ciao! a biscuit festival would be just a luvFAB treat. great captures. 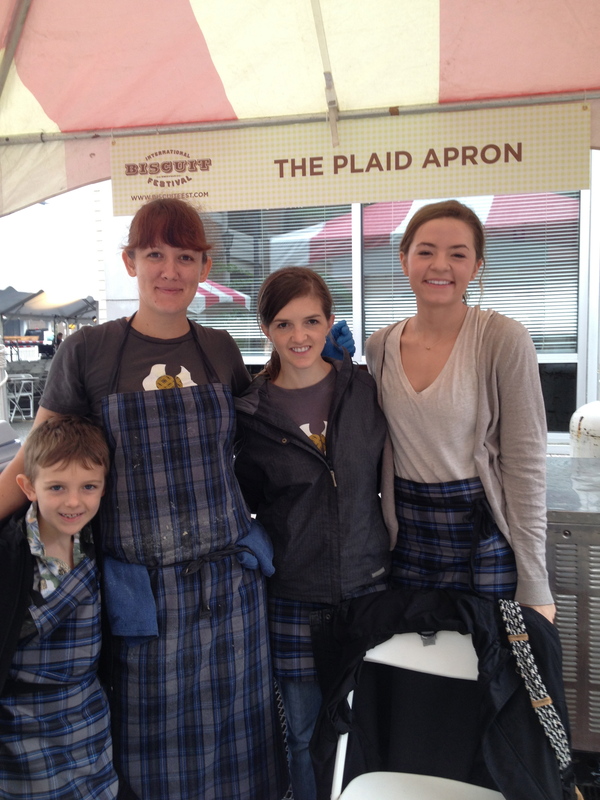 Just come on to Knoxville and eat some great biscuits! We love this festival, and one ticket gives you your choice of three biscuits — more than we can possibly down at one time. We leave full and happy! Pingback: Oh, the Places We’ve Seen: 2013 | Oh, the Places We See . . . So good to hear from you. I love the Namaste at the end of your comment. We heard that all the time in Nepal! Best wishes for continued success! My mother, bless her heart, was a housewife of the 50s and 60s. She thought homemade biscuits meant that she slammed the container against the edge of the counter so she could release the refrigerated biscuit dough inside the cylinder. But, as you all said, they were my mother’s biscuits and I thought they were great! Only later did I find out that “real” homemade biscuits are a little different. And I am loving experimenting to determine the best. 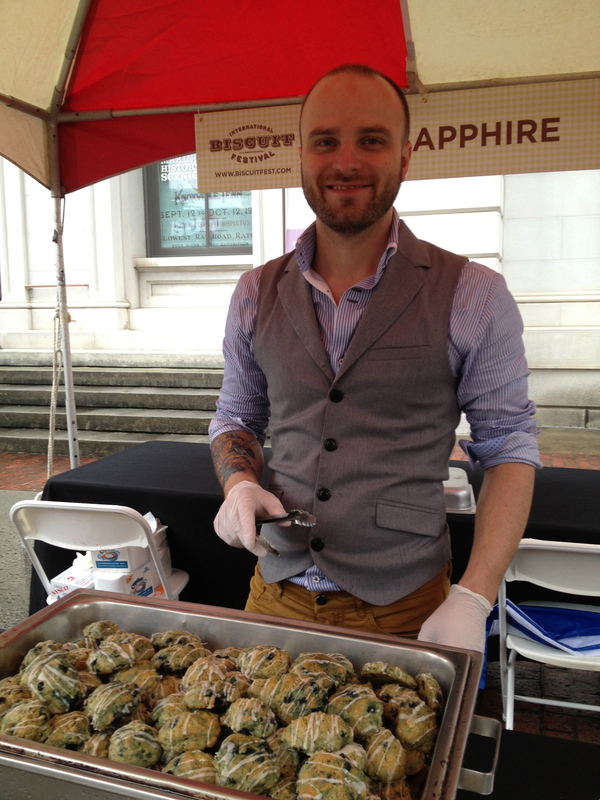 I don’t know how all these vendors at the Biscuit Festival can bring hot, fluffy, delicious biscuits to a tent downtown, but they do. The least I can do is show my appreciation for their efforts by diving in!!! Thanks for commenting, Cynthia! You’re my kinda guy! 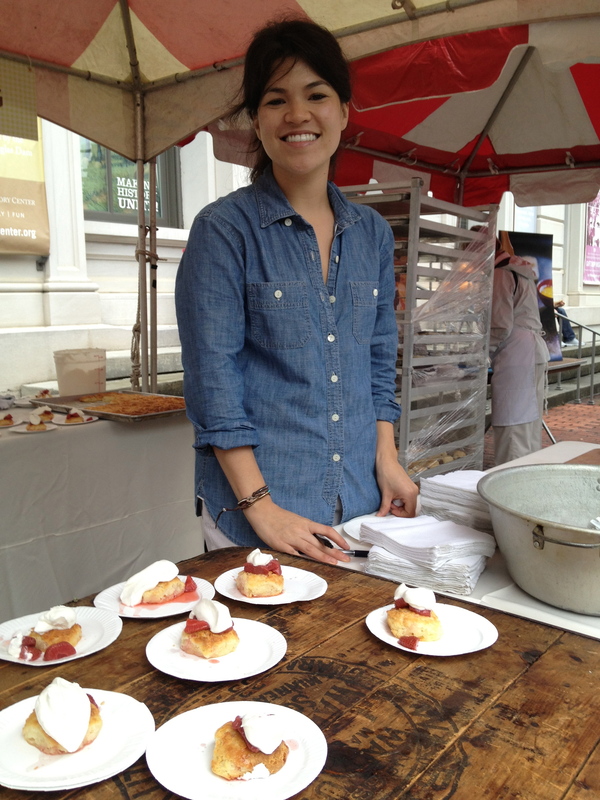 I had no idea that this biscuit festival would take off the way it has — so popular now. But I guess it’s the same sentiment you just shared: never a bad biscuit! I have to agree that my mom’s biscuits were great, and so was her cornbread. She didn’t, however, have access to Benton’s bacon!!! Thanks for reading and commenting, Mary.